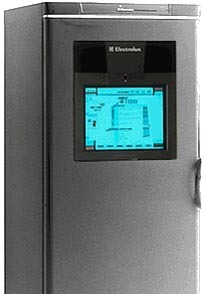 1998: The V-sync "Internet Refrigerator"
"With a speedy Pentium II microprocessor and huge hard drive, it packs more computing power than most home PCs, and has separate compartments for fruit and vegetables." "Electrolux earlier this year unveiled the Screenfridge, a connected refrigerator designed to allow users to order groceries over the Internet, but the product has yet to ship." 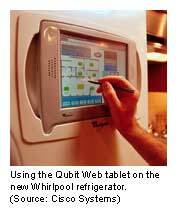 "While the Whirlpool refrigerator won't cook an omelet, it does have an integrated Web-browser to search for recipes that match the food items people have on hand. In case you have no idea how to make an omelet, you can prepare the meal by watching a celebrity chef on the Web pad." 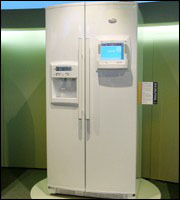 "Whirlpool's refrigerator transforms into a multimedia communications centre. The owner can surf the Internet, receive e-mails, listen to the radio, watch TV, videos and DVDs and even talk on the phone." "It's the ultimate in kitchen technology with a built-in MP3 player for downloading and playing music from the internet, e-mail and video mail using a built-in camera and microphone. It even has full internet access so you can re-stock the refrigerator on-line or check on the latest news and weather - all without leaving the kitchen. And it's great for storing food too." 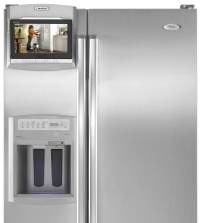 "The Screen Fridge is connected to broadband and TV via wireless connection. 15" touch screen and pop-up keyboard. As if Internet, email, phone, radio and MP3 player are not enough, Electrolux adds highly advanced calendar and video messaging system so the kitchen truly becomes the center hub in your house." "Custom choices will include satellite radio, a Web tablet with interactive message board and family calendar, a digital picture frame, a DVD/CD player and more." I like to watch how companies try the same idea over and over and how the ideas evolve. 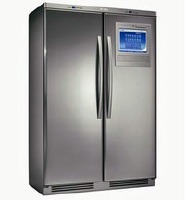 Initially, the computer fridges were just tablet PCs stuck into the door of a conventional refrigerator. Why were they there? Who was going to be using it? How were they going to be used? No clue. And sure you could do all the stuff they advertised (listen to music, make a phone call) because you could do anything you could do on a laptop. You could compose a Powerpoint or write software, too, but you wouldn't do that, or anything else, because there was no clear reason for it. The products quickly disappeared with the end of the first dotcom boom. Then a resurgence happened. What was different? I think that companies, helped by the staff user researchers they hired in the interim, started to realize that it wasn't the computer that was important, but what people did with it. 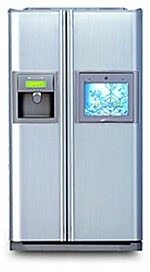 Not until the most recent Whirlpool offering does the idea of a computer fridge disappear entirely to be replaced by a series of functions that various modules can do. Each module is, of course, a computer, and every module can probably do the same functions as the other modules from a computational perspective. But that's not the point. The point is that the modules have different interfaces. They're different tools. Focused tools. Tools where the design uses a computer to help the user accomplish a task, just as they use waterproof plastic for the buttons and stainless steel for the shell. This page contains a single entry by Mike Kuniavsky published on January 7, 2008 7:24 PM. Turned off comments was the previous entry in this blog. Sketching Smart Things, a presentation for CHIFOO is the next entry in this blog.